If you’re reading this, chances are you are an animal lover and you have at least one furry family member. There are, however, a lot of people who do not love dogs (and, even more so, cats). While those of us who do love them will never understand why, one reason could be the concept that our companion animals can make us sick. Whether you have a cat or a dog, pet waste disposal is your responsibility. And there are ways you should, and should not, go about it. 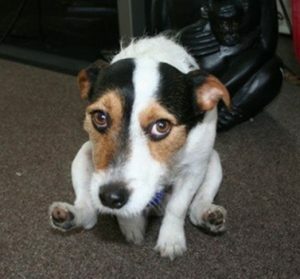 One thing all dogs have in common at birth is a cute tail that will wag and communicate very effectively about how your dog is feeling at any given moment. Bringing your dog to doggy day care in Yarraville at our Urban Paws Dog Day Care Centre has many positive benefits for you and your dog. Not only can you feel comfortable to go to work or out and know that your dog is being cared for well in your absence, there are a myriad of positives specifically for your dog when he or she goes to day care, whether it’s for a couple of hours, a whole day, or on a regular basis. Reduced Boredom. A bored dog can be a destructive dog. With dog day care, there is no time for boredom and your home and garden will be much better off for it. It also removes issues like barking which annoys neighbours. Alleviates Separation Anxiety. Many dogs don’t cope when their master or mistress is absent, especially if they are left alone. Loneliness leads to anxiety, depression and unwanted behaviours. The company of other people and other dogs is the antidote to this! Provides Routine including Exercise. 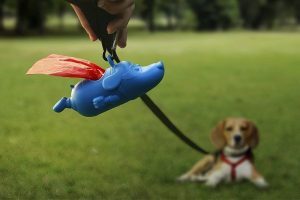 Too many of us are too busy or tired after work to exercise our dogs properly. Dog day care takes this responsibility on for you and at the end of the day you come home with a tried, happy dog who is thrilled to see you yet ready to relax. Playtime at dog day care allows your dog to express normal canine behaviour in a fun environment with other dogs. Dogs develop friendships just like humans do. The right dog day care centres offer a safe, well supervised environment for your dog. 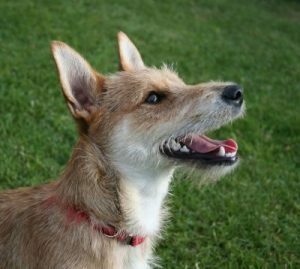 Yards and play areas are secure, dogs are grouped according to compatibility, and all dogs are continuously monitored closely. Human Contact. Dog really is man’s best friend, and he thrives on human company. 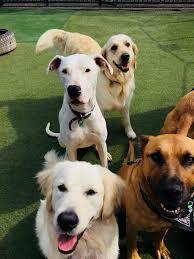 Dog day care means your dog need not spend the day alone while you are out nor need he be locked up if you are entertaining and can’t have him join you. Dog day care staff interact with the dogs in their care, offering cuddles, pats, treats, and playtime. Christmas will be here before we know it. Santa is making his list and checking it twice. But there is one gift idea that you too should really be thinking twice about before you take the leap – that is giving a pet as a gift. It seems that at this time of year more than ever, pet stores are full of cute, cuddly, adorable little four legged furry friends who are so tempting to give a home to on a whim. What could be a better Christmas gift? The love and interaction between kids and dogs can be a beautiful thing. Yet all kids, especially young kids, need to be carefully supervised, even when with the gentlest of dogs. Any dog can bite a child or even a baby. 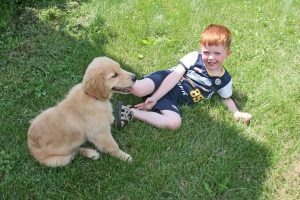 It’s rarely a predatory action from the dog, but more a protective instinct – if a child accidentally hurts or annoys a dog, if the dog is startled or perceives a threat, or if the child comes too close to the dog’s food or toys. Most dog bites occur at home or in the homes of family and friends. Most are from dogs that have never exhibited aggression before. In the majority of cases, dogs bite when kids are playing unsupervised with the dog, or when the dog is disturbed when sleeping or eating. • Separate kids from dogs when dogs are eating, chewing a bone or treat, or sleeping. Also, keep kids away from dogs that are sick, injured, or with their puppies. • Teach children to always ask permission to pat a dog, even if they know it well. • Teach children to let a dog smell the back of their hand before patting it. • Set a great example – kids will copy what you do! It’s important to be very definite about teaching kids to never approach an unfamiliar dog. If you are bringing a newborn into a home with a dog, be prepared that the dog may feel some ambivalence or jealousy. Use child gates in the home to keep the dog out of the baby’s room. Keep loving and being attentive to your dog, and take the time to introduce him to the new baby, allowing him to smell the baby while giving him reassurance and praise for being a good boy. Never leave a dog alone with a baby. 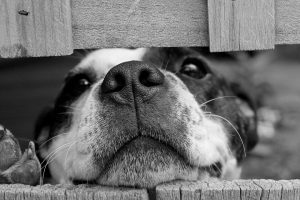 Being a responsible dog owner involves much more than just dog walking, feeding, and providing shelter. And being a responsible human parent involves teaching kids how to be with dogs. Statistically, eighty percent of Australians will have a pet at some point in their life. 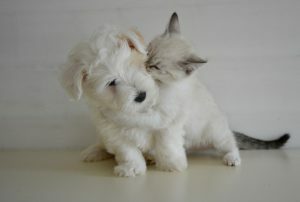 As such, companion animals or pets are an integral part of life for most of us. Pets are beneficial to everyone, at all stages of life, and this is no truer than it is for children. Kids who have pets not only benefit from the enjoyment and reciprocal love a pet provides, but they also learn skills and develop responsibilities that they carry into adulthood. They also learn to love and respect all animals. 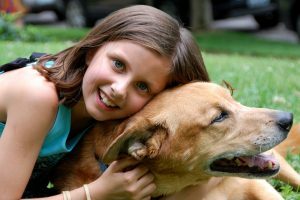 For many children and adults alike, relationships with beloved pets are more highly ranked than many of their human relationships – pets help provide and develop self esteem, confidence, support, and comfort. Children with a pet will often develop a more highly attuned sense of nurturing, as well as empathy, caring, responsibility, and even communication. Kids who have dogs will also be more physically active and fitter if they take the dog walking, or run and play with their pet. 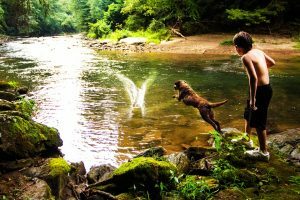 Studies have even shown that children who have pets enjoy a higher level of self esteem and better social skills as a general rule than those who don’t have any pet at all. It has also been shown statistically that families with a pet enjoy better family harmony, interacting more with each other and the pet. Pets provide many health benefits to their human family members. Dogs and cats in particular are very powerful stress relievers (except when they are barking, digging up the yard, or scratching at the furniture!) and cuddles with your pet are very relaxing. Pet owners are also shown to have fewer visits to the doctor, suffer from fewer minor illnesses and physical complaints, and have a markedly decreased risk of developing cardiovascular disease. It does need to be noted that kids and pets, especially small kids, need to be supervised carefully. Cats have a natural instinct to bite or scratch when feeling threatened, just as a dog’s natural instinct in such cases will be to bite. This is often an involuntary reaction. In our next blog, we’ll look at ways to make sure your kids are safe with dogs.